When you think of Minneapolis, MN weather you may want to forget about the hot and humid summers that bring out the wasps and bees in full force! Wasps and Bees can be extremely dangerous, especially to those who are allergic to their stings. Someone who is allergic can quickly become seriously ill if a bee or wasp stings them. Don’t let this happen at your home this summer – contact the local Minneapolis wasp elimination and removal experts at Eco Tech to take care of your problem once and for all! Why are Wasps so Dangerous? Wasps are dangerous to humans because they often will build their nests in close proximity or actually inside our homes. If you’ve ever seen a mud type tunnel located in your home or near your windows, it’s likely a wasp nest. Wasps are actually not very aggressive insects, unless of course their nests are threatened. Many times humans do not realize that a wasp nest exists and get too close, which results in the wasps being provoked. For some people being stung by a wasp can create a painful and sometimes deadly anaphylactic reaction that can be extremely serious. It is important for those with allergies to wasps or bees to keep what is usually called an EpiPen with them at all times to prevent a bad reaction to a wasp or bee sting. 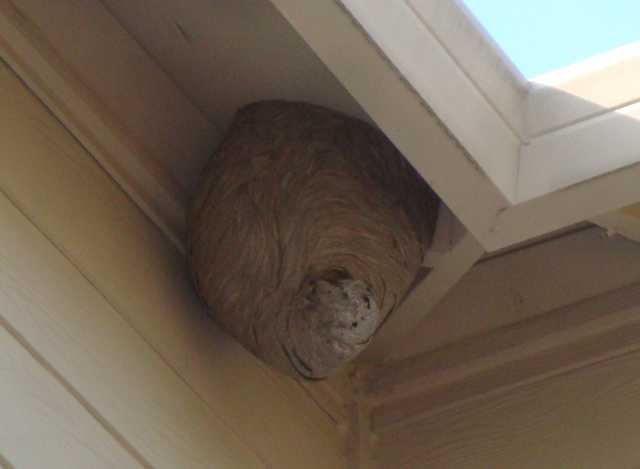 If you’ve spotted a wasp nest in or around your home, you should not try to take care of the problem yourself. There are various types of wasps and you never know just how many you are dealing with. A wasp nest can look deceivingly small yet still house a large number of wasps. The key to knowing how to handle a wasp nest is determining the type of wasp that you have in or around your home. By working with a professional wasp elimination team like Eco Tech you can ensure that your wasps are taken care of quickly and safely. While there are all sorts of “wasp sprays” that you can find at the local hardware store, these products often are not very effective and don’t actually get rid of the wasp nest itself. With a professional wasp removal company, you’ll no longer have wasps and you’ll also be rid of the dangerous nests as well! If you’ve seen several bees or wasps around your home it may be time to call Eco Tech to give your home a thorough inspection. We’ll identify what type of flying pests you have and work on a detailed pest control plan to handle your wasp problem for good! Contact us today to setup a free consultation at 763-785-1414.